Are you stashing away fewer dollars in your retirement or savings accounts? You're not alone. The U.S. Bureau of Economic Analysis reported that Americans are saving less money today than they have at anytime since 2007. The bureau reported that the U.S. savings rate fell to 3.1 percent in September 2017. That's the lowest it's been since this rate fell to 3 percent in December of 2007. If you recall, 2007 wasn't a great economic time for the United States. It was the beginning stages of the housing crash and the Great Recession. This prompts the question: Is the low savings rate a warning sign that the national economy might be in line for a slowdown? And why are people saving less? The lower savings rate might mean that consumers are more confident in the economy. Instead of putting their dollars in traditional savings vehicles, people are investing more in the stock market and other assets. That happens when the economy is strong and investors think they can realize stronger returns. At the same time, consumers were spending more. The same report from the Bureau of Economic Analysis found that consumer spending rose 1 percent in September. That jump is the biggest since 2009. Again, this could be an indicator that consumers are more confident in the national economy. But, it could also be a worrisome trend. The drop in the savings rate at the same time that spending is up might be a sign that Americans aren't necessarily earning more, but are spending more at the expense of their savings. This trend is a dangerous one, as it can put more people in financial trouble down the line. Of course, you can't worry about what people across the country are doing. You can, though, take a look at your own finances to determine if you are saving enough money. 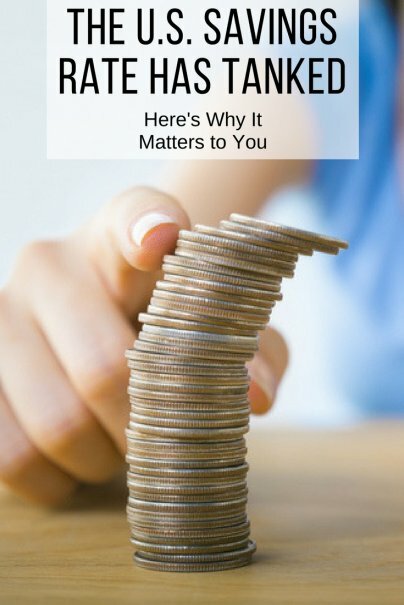 Exactly how much should you be saving? That's a complicated question, but a few rules of thumb can guide you in the right direction. How much you need for retirement varies depending on a host of factors; everything from what kind of retirement you want — one that involves a lot of traveling will cost more than one in which you spend most of your time golfing or fishing — and how much income you'll be earning each month. As a general rule, financial experts recommend that you save 10 to 15 percent of your income each year for retirement starting in your 20s. If you hit this goal every year, you should be able to build a solid nest egg for your post-work years. The challenge, though, is that this is such a general approach to retirement savings. It doesn't take into account the vagaries of your own financial situation. You might not have to save as much if you have royalty income, you plan to work part-time after leaving your full-time job, or you have inheritance money to rely on. And about that national savings rate? Just because some Americans are spending more and saving less doesn't mean you have to follow the trend. Stick to your savings goals if you want to enjoy a lower-stress financial life.